LINCOLN — Energy produced by Prairie Breeze Wind Energy may one day benefit the City of Neligh. The City of Grand Island is planning to purchase 100 percent of the energy produced from the recently announced Prairie Breeze Wind Energy III, LLC wind turbine electric generation facility. Although Grand Island would be the singular purchaser of the energy output, there are conversations taking place between Grand Island and city officials in Neligh and Nebraska City to allow the other two cities to take some of the power generated by the wind farm.These negotiations are solely through the City of Grand Island. According to testimonies at the Power Review Board hearing on May 22, no official contracts have been signed, but the City of Grand Island has signed a letter of intent with Invenergy, LLC, the parent company of Prairie Breeze Wind Energy III, LLC, who is overseeing the project. Prairie Breeze Wind Energy III, LLC went before the Nebraska Power Review Board and looked for conditional approval to move forward with the plans to begin building the facility. The Nebraska Power Review Board did conditionally approve the request during the hearing despite the lack of a contract between the two entities. Representatives of the City of Grand Island and Prairie Breeze Wind Energy III, LLC said the contracts would be signed in early June and that this was a rare circumstance. Tim Luchsinger, the utilities director for Grand Island said the contracts have not been officially signed because the city is still currently waiting on finalizing the power purchase agreement, but it must be finalized by the next board meeting on June 19. Since the project was approved, it allows the facility to move forward with lining up financing, construction crews and materials. 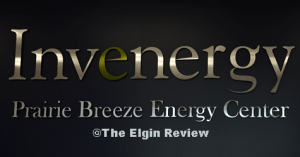 According to Invenergy, the cities of Neligh and Nebraska City are then planning to purchase from the city of Grand Island a portion of the output from Prairie Breeze III, through participation agreements with the City of Grand Island. Nebraska City would purchase approximately 20 percent of the project output, Neligh would acquire five percent of the project output. Leroy J. Frana, general manager of Nebraska City Utilities and one of the Neligh City Attorney Joseph McNally, also testified in front of the board on behalf of the pending deal. The proximity to Prairie Breeze Wind Energy II, LLC creates a convenience and therefore lower cost for the City of Grand Island because of the infrastructure that is already in place.